Another early visitor to the ruins of Antinoupolis in Egypt, made by order of Louis XIV, no less, was the French knight Paul Lucas (1664-1737). His rather derivative account appears in his Voyage Du Sieur Paul Lucas, Fait En M.DCCXIV, &c. Par Ordre De Louis XIV. Dans La Turquie, L’Asie, Sourie, Palestine, Haute Et Basse Egypte, &c Ou l’on trouvera des Remarques très-curieuses, comparées à ce qu’ont dit les Anciens dur le Labyrinthe d’Egypte, volume 2 (1720). Large sections are copied or condensed from Sicard, which makes one wonder how much Lucas really saw. The triumphal arch at Insine [Antinoupolis] / The gate of Iron. 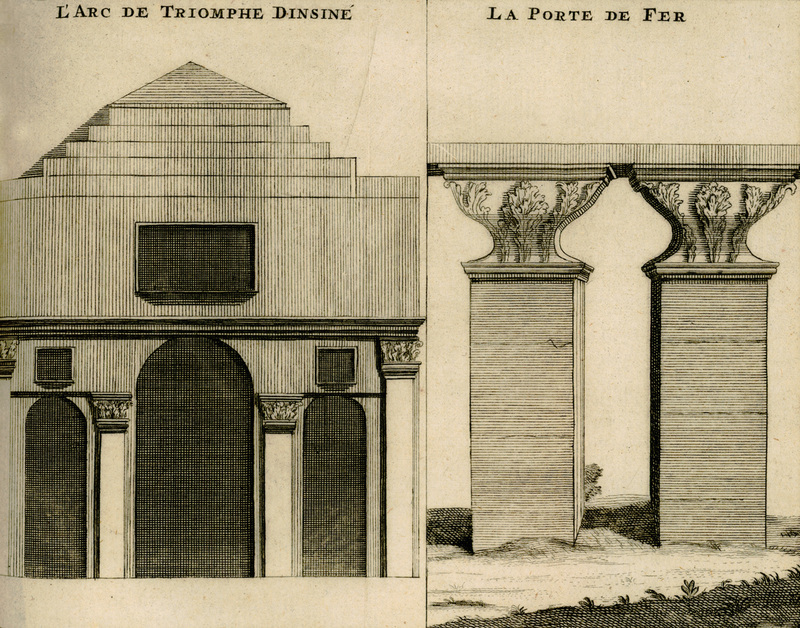 On p.333, in the catalogue, we find this plate described as follows, however “The plan and elevation of the triumphal arch at Insine or Antinoupolis, with the design of two large pillars, of an unusual order of architecture, which are in the same town.” This no doubt is the real caption of the plate. 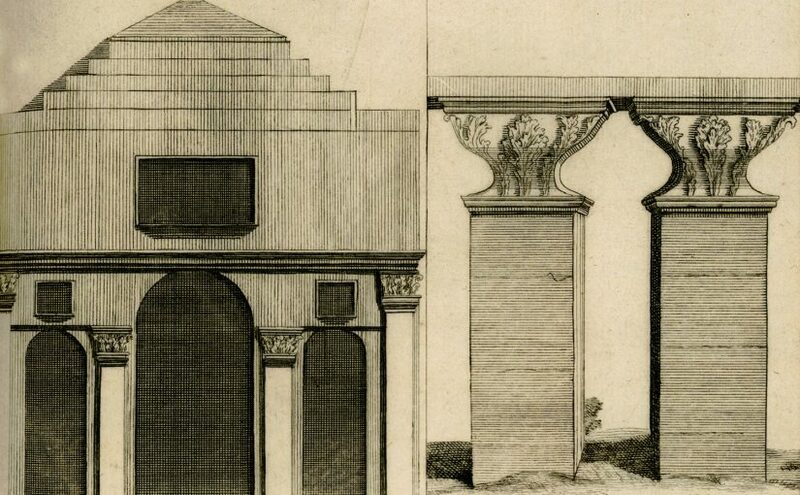 The drawing of the pillars is very bad, as Sonnini de Manoncourt notes in his account (with better illustration) from 1778. Lucas gives the following account of his visit, starting on p.59. As before I have turned this into English with the aid of Google Translate. In the evening we reached the town of Insîné, which is 50 or 55 leagues from Cairo on the east bank of the Nile, where valuable remains of royal magnificence can still be seen today. This town is in fact the same as Antinopolis, which the Emperor Hadrian built in honor of the youth Antinous. It is known that this emperor had a mad passion for this favorite, and that this led him, after he had lost him, into outrageous extravagances. The historians do not agree on the circumstances of his death. Some say he died of illness; others that he immolated himself as a sacrifice, where impiety and magic were also employed, for the recovery of the health of the Emperor; still others, and this is the most general opinion received, say that he drowned in the Nile, on which he was sailing with his master. This event happened in the year 132 of Jesus Christ. The grief that Hadrian had at the loss of this young man, whom some scholars believe to have been of noble birth, was extreme and went to unexampled excess. He forgot nothing to make his memory immortal: he built on the Nile a city, magnificent through the various ornaments with which he embellished it, and gave it the name of this favorite. He dedicated Temples to him, and he instituted games in his honour; he then celebrated with lavish pomp, the ceremonies of his apotheosis; and so that nothing might be wanting to the glory of this new deity, he established in these temples an Oracle, whose answers he composed himself. These are the ruins of this city, now called Insiné, which I will describe. This city was divided by two great streets, about 45 feet wide and 850 yards long, and they ended in four large gates. From the two streets, which formed a kind of cross, several other transverse streets were drawn, which were less wide; but of an equal length, all perfectly straight; as may still be seen from some remains, along the whole length of these streets there were two galleries, five or six feet wide, which were supported on one side by houses and on the other on finely-worked stone columns, so that this city was a continuous peristyle, where people on foot were always covered from the heat of the sun and from other injuries of the air. Many of these columns can still be seen, overthrown, in all districts of the city, and also some remains of the arcades. There is debris everywhere, so that one is obliged today to walk in the middle of the streets. I noticed outside of the city a place now called the Meidan; it’s a place about eight hundred yards long, and only 70 wide. It was probably the circus, where they celebrated the games established by the Emperor in honor of Antinous. Its length and shape marked the course of the horses and chariots which were part of the celebration of these festivals. This place is surrounded by very large stones, and I have seen up to eight rows of them on top of each other, which formed perhaps a kind of amphitheater where were the boxes for the spectators. Now let’s go back to the city, where everything is now ruined, except for three or four buildings, and some pillars which are still standing; what is today called the Iron Gate, and of which the folding doors, covered with plates of that metal, were taken to Cairo to be used to close an arch which is near to the palace of the Grand Provost, where I saw them. There is nothing complete except for two pillars with their capitals, such as may be seen in the illustration that I give here. They are forty feet high, without counting the part which is buried in the earth, and eighteen feet wide. They are square, and there is fifty feet distance from one to the other. Two former palaces can still be seen, one of which was called Abu Elquerou, the “father of the horns”, because of its sharp edges, cornices & capitals; and the other Melab-Elbenat; that is to say, the pleasure house of the princesses. I saw them examined them both. I measured the columns of the Corinthian order, which are grooved from their base to the middle, and joined beyond that to the capital. These columns are of a beautiful white stone that seems to have been drawn from the neighboring mountains, where we still find similar stone today; they are fourteen to fifteen feet in circumference, and about 40 feet high; the capitals are made of two parts, and are each seven feet and a half in diameter. I cannot agree that these two buildings were the gates of the city; because what purpose would this many porphyry and granite columns have served, which are around the area, and of which there are still about twenty which are on their bases? I believe, without hesitation, that they were magnificent palaces, of which today only the porticos, or main entrances, remain; the names that they are given today confirm this conjecture. I discovered a third of them at some distance beyond, which I call the triumphal arch of Insiné, and of which I give here an illustration. This is a large portico, where there are three arched openings, each of which has an upper window proportionate to its size, and there is a staircase to ascend within the wall. There is in this portico four beautiful square columns, all the stones united with their capitals, and above the window which is over the middle door, there is a beautiful stone entablature which makes the top of the building a triangle. The scale which I give for this purpose, shows all the dimensions exactly. Leaving by the iron gate, I was led by an Arab to a tomb believed to be that of a companion of Mohammed named Abon, and which is under a very beautiful vault. There are around twelve others, which the Arabs say are the twelve main friends of this false prophet, or rather his main advisers, as appears by the name of Sanbey which is given to them. The town of Insiné is now only a wretched Village, whose houses, built mostly of earth and mud, are backed and supported by these beautiful columns of porphyry and granite, which I mentioned. This hamlet can only be recommended today by a very attractive mosque, which I am assured was once a Christian Church; it is built of very large stones and decorated inside with several columns that were transported from the city, and which are placed in an extremely odd order. It is the custom of the Turks throughout the Levant to take the most valuable pieces of antiquity for their mosques, which they employ without genius and without design, confusedly mixing different kinds of architecture, and large columns with small. The chief of the mosque came to receive us with great politeness, and showed us the apartments that once apparently served to accommodate the monks, and which are used today by the Turkish pilgrims that devotion attracts to this place, which is of great veneration among them, because of a Sheik who is buried there, and whom they treat like a saint, without knowing, however, if he was of their religion. I was assured that he had once been the Bishop of Insiné; his name was Ammona or Abona Abede: the word “Abona” means a monk: adding that he had shed his blood to uphold the faith of Jesus Christ; his tomb, which is in a chapel of the mosque, is shown. This Sheikh gave his name to the village which is among the ruins of Insiné, and that is now named Sheikh Abade. After visiting this mosque, I went to a place where several beautiful columns can be seen, of which there is one that is still standing with its capital, which is a beautiful white marble stone that once supported a statue; it was undoubtedly of Alexander Severus who is mentioned in the inscription. The pedestal of this column is of eight courses of stone, and about thirteen feet high; the column is four feet in diameter, and its foot is of five parts. The first, which is the the nearest to the pedestal, is three and a half feet in height, and is surrounded by foliage that gives it much grace. The other four parts were each seven feet tall. On the pedestal was the inscription which will be found at the end of this book. As it is much mutilated, I had great difficulty to copy it; the curious may compare it with that of Father Siccard, and I beg the reader to read the scholarly reflections that he has made on the subject. Near this column of Alexander Severus may be seen three others which are overturned, and whose inscriptions are now so effaced that it is impossible to read them; one pedestal may still be seen which is not at all destroyed. The place where these four columns were was a square, or rather a crossroads, where met the two large streets crossing the city from one end to the other, and which was large enough to receive the ornaments which I have just mentioned. That is all that now remains of a city once so beautiful, that the Emperor Hadrian built it to perpetuate the memory of a mad passion, which will forever tarnish his glory. Having spent much of the day in this place, and suffered much from the excessive heat that day, I went up on to a little eminence, formed by a heap of ruins, from where all these ruins can be viewed, and it seemed to me that this city must indeed have been four or five miles round. When I left Insiné, the Arabs who were with me, told me that it was Muhammad himself who had once made himself master of this city; but that it revolted as soon as he left, which angered the conquering legislator so much, that he sent his lieutenants, with orders to destroy it, and to put the inhabitants to the sword, and that since that time it has been deserted. Because the few Arabs who live there at present count for nothing, who live under the obedience of Sheikh of the mosque, which is called Sheik Abade, and gives its name to the area, and which is exempt from paying any tribute to the Sultan; but all this is simply a fable which marks the profound ignorance in which the Arabs live; Muhammad never carried his arms into Egypt and did not leave Arabia. That the same people told me that the city was once called Insiné is more likely, and we cannot doubt that the name is a corruption of that of Antinous, whose name the city which I just visited bore. All the ancients agree with Ptolemy and the Antonine Itinerary, that it was in the district of Upper Egypt, on the eastern bank of the Nile, and that it gives rise to the adjective Antinopolite: but I cannot share the feeling of those who say that the Emperor did but restore an ancient city that was in that place, and named it after his favorite: because as I have just described it, it appears that it was built anew, as we learn from Xiphilinus, despite what Casaubon says, who claims that the city was in that place was previously called Besa, and was dedicated to the deity of that name. The reader may wonder where is the fresh transcription of the inscription on the column of Alexander Severus, to which Lucas alludes. Well may we wonder: for it is not to be found in the text as printed. There are a couple of short inscriptions on p.131 and 136, from Dendera; but I was unable to locate any transcription of that at Antinoupolis, either at the end of “book 5” or of the volume itself. Oh well.